That some things are stranger than fiction is a platitude, a commonplace. But when in our daily lives we encounter what would, between the pages of a book, be unbelievable, the truth behind that cliché comes back to us. At Flying Dog Brewery, they have themselves an origin story that seems, indeed, stranger than fiction, too wild, too improbable to be true—and that story involves a famous author, no less. The story begins in the Himalayas, as future Flying Dog founder George Stranahan set out to climb K2, the world’s second highest mountain, and among the most treacherous; nearly 25% of those who attempt its summit never return. The trip was a success, as Stranahan and his party summited K2, returned safely, and only faced one minor disaster: “On day 17 of a 35-day trip, we totally ran out of booze.” Having returned to a hotel in Rawalpindi, Pakistan, the group settled in for a few triumphant drinks, and were struck by a large oil painting depicting a dog in mid-stride, or mid-leap, suspended above the ground—a Flying Dog. George returned to the United States, and, in honor of his climbing experience, named his residence in Aspen, Colorado, Flying Dog Ranch. 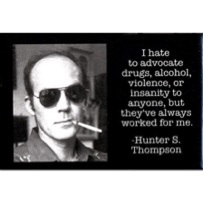 Down the road (/down the mountainside) lived none other than Hunter S. Thompson, famed writer (Fear and Loathing in Las Vegas, The Rum Diary, etc. ), and famed drinker (anything, etc.). Bonding over beer, whiskey, and stories of adventure (often involving the aforementioned libations), the two became good friends. Eventually Hunter introduced George to his pal and oft partner-in-crime, the illustrator Ralph Steadman; the three would soon together stake their claim not on mountainsides, or in novels, or the pages of magazines, but in the world of craft beer. 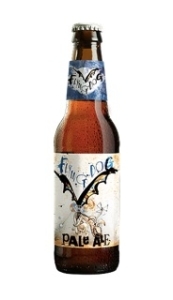 Flying Dog’s flagship brew has dropped the risqué moniker, but remains every bit as alluring as it was when it won top honors at the Great American Beer Festival in 1991. This English-style Pale Ale has all the drinkability of its English brethren, but with just a bit more oomph from its Western US roots. The English Northern Brewer hop provides its backbone, but with ablend of American hops thrown in—Cascade, Citra, and Simcoe—boasting higher alpha acids, it has a pleasant hop aroma to appease the IPA lovers. Still, at only 35 IBUs, at 5.5% alcohol, it’s certainly a drinkable, even sessionable ale. Brewed in Honor of the late Hunter S. Thompson, the appropriately named Gonzo Imperial Porter is, like the man himself, a force to be reckoned with. At 9.2% alcohol by volume, this bad boy can bring on the pink elephants after a few rounds—but don’t let the punch it packs scare you off; this is an excellent beer. A blend of chocolate, black, and caramel malts (and a whole lot of ‘em) give this imperial porter a pleasant blend of coffee and dark chocolate notes, with a smooth mouthfeel on the palate. Unlike some overly-sweet imperial beers, however, Gonzo’s got it going on in the hop department. With high-alpha Warrior hops rounding out the Northern Brewer and Cascade, this beer has an IBU count of 85, and for good reason. The sharper, acidic hop quality helps to cut the beer’s heavy malt profile, keeping it from being cloying on the palate, and helping produce a (dangerously) enjoyable imperial porter. And with Gold Medals at both the Great American Beer Festival and the World Beer Cup, it would seem the critics agree. “Two inflammatory words…one wild drink. Nectar imprisoned in a bottle.” So Ralph Steadman described this intense beer. And it is a wild one. 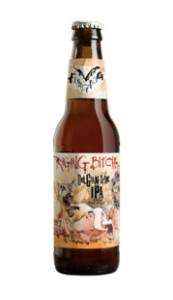 Flying Dog initially released this as a specialty offering, but after an overwhelmingly positive response, they decided to make it a staple, year-round offering. This beer begins as a fairly straightforward, high alcohol American IPA (it clocks in at 8.3%), utilizing Warrior, Columbus, and Amarillo hops. In 60L Caramel, it has a bit darker malt than some IPA’s, but still not enough malt sweetness to keep the hops from running rampant. But the distinguishing factor for this dog is its Belgian yeast strain, which the brewers dub El Diablo. The combination of intense hops and Belgian yeast yield a brew with some sharp, citrus hop acidity, but combined with tangy fruit notes. This is a beer that will have even the calmest dog whisperer howling for more. In May, I attended a good friend’s wedding; the power went out before the ceremony, and then came back on—and the lights came up—just as the priest queried those in attendance, “If anyone has a reason these two should not be wed, speak now or forever hold…” And that’s when God (or the electrical company) turned up the lights. If Hunter S. Thompson were here, he’d probably caution, “You can’t write that in your novel; no one will believe it.” Well, you probably can’t write that an intrepid mountain climber was shooting guns and drinking beer with a famous author when he decided to open a brewery—but lo and behold, we have us Flying Dog. And we’re better for it. 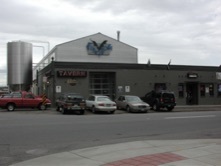 Since the brewery’s inception, it has moved several times, as demand has grown, and today the majority of its beers are brewed far from the mountains of Colorado, in Frederick, Maryland, on the East Coast of the US. Still, if the barrels are fermenting outside of Colorado, Flying Dog has kept to its wild Western roots, continuing to produce excellent craft beers, sometimes a sessionable ale that’s been at the top of the craft beer scene for a quarter century, other times pushing the envelope with their high ABV experiments. But whether it’s an easy-drinking ale or a kick-in-the-teeth imperial brew, Flying Dog continues to produce what they began with: Good Beer for Good People.